While in Singapore, the percentage of technology companies that plan to hire aggressively increased to 4.9 percent, in India it jumped to 21.1 percent in Q3 2018. As per the latest report from Radford, a division of the rewards solutions practice at Aon plc, the fast-growth, developing markets of China and India report the highest increases in pay at 7.8 percent and 10.5 percent, respectively, while for Singapore, salary budgets are expected to remain flat at 4.0% in 2019. However, for technology companies, both the pay hikes and hiring plans look positive in most of the APAC countries. 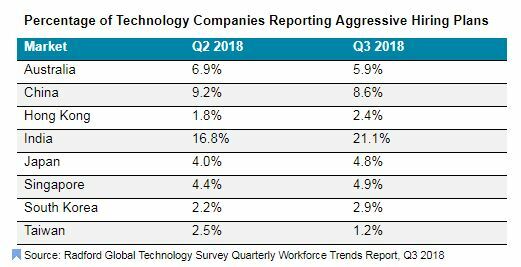 In Singapore, the percentage of technology companies that plan to hire aggressively increased for the second consecutive quarter to 4.9 percent and India witnessed the biggest jump with an increase from 16.8 percent in Q2 2018 to 21.1 percent in Q3 2018. As tech companies plan for robust salary increases in 2019, they continue to battle in maintaining low employee turnover rates. 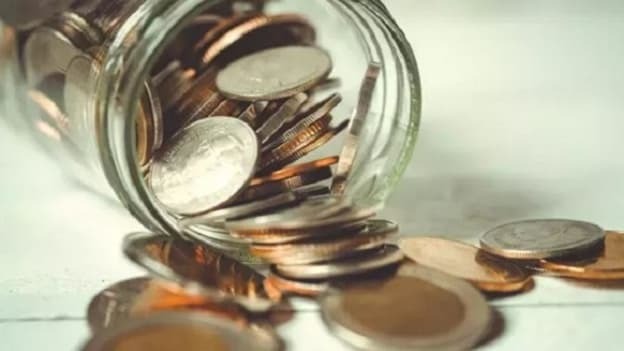 Displaying high attrition rates, the Voluntary employee turnover is up for the past quarter in six out of eight markets with percentage being highest in Australia at 13.8 percent followed by China (13.7 percent), Singapore (13.2 percent) and India (12.6 percent). Clearly, tech companies are still struggling to engage and retain talent. 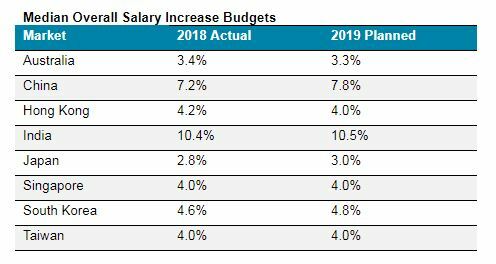 Therefore, highlighting that the forecasted increase in salary budgets in several markets alone won’t be enough to hire, engage and retain talent in a hot labor market. “Companies must assess what jobs are needed for future growth and hire for those roles in a competitive marketplace while also engaging and retaining their current talent when many other job opportunities exist. Businesses with a voluntary turnover of above 10% should evaluate their employee value proposition and talent practices carefully” says Alexander Krasavin, Partner and Radford Leader for Asia Pacific, Middle East, and Africa.